Jennifer Furniture President John Garg at the retailer’s flagship and top performing store in Farmingdale, N.Y.
FARMINGDALE, N.Y. — Jennifer Furniture is expanding its brick-and-mortar and e-commerce footprints after a few years of post-bankruptcy struggle and work to reposition the brand as a full-line retailer. Now led by President John Garg, the retailer — long known as Jennifer Convertibles before a 2010 Chapter 11 bankruptcy filing — has consolidated down to 17 Northeast showrooms, culling all the unprofitable, smallest locations and weakest markets. But the new Jennifer’s house is now in order, Garg said, and over the next few months, it will open five showrooms in New York and New Jersey and more next year. It recently partnered with Amazon to become a furniture seller on the e-commerce giant’s marketplace — an arrangement that Garg said already is paying dividends. It has launched a second website focused on e-commerce sales of the products it’s most known for: sofa beds. And its owner, Gebing Zou, who leads the publicly held Morris Holdings in China, is in the process of selling his Jennifer stake to Morris for $35 million and will use part of the proceeds to support still more Jennifer growth. The plan, Garg said, is to open a minimum of 10 stores a year beginning next year, including expansion in the New York, New Jersey and Connecticut Tri-State area and then back into Boston, Philadelphia and Maryland where it previously operated. This is all while Jennifer supports its new online business, which has grown to about 15% of overall sales from zero just two years ago. Total sales for Jennifer are projected to grow to at least $48 million this year, Garg said, up from a reported $40 million in 2017. The loss last year was about $2 million, according to a document outlining the stock sale to Morris Holdings. Garg, who joined the retailer in 2014, conceded the road back to this stage has been a rocky one. Then Woodbury, N.Y.-based Jennifer Convertibles was a long-time, publicly held Top 100 company, with store count peaking in 2004 at 219 showrooms and sales topping out in 2006 at about $172 million. In 2010, the struggling Jennifer collapsed into Chapter 11 bankruptcy protection, emerging the following year with about 72 stores remaining and controlled by its largest supplier — a Chinese upholstery producer now called Morris Holdings and led by Gebing (Morris) Zou. 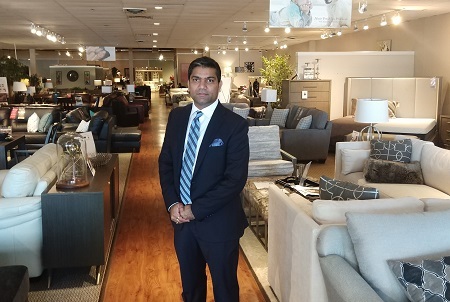 Garg, an industry veteran and once part of the Levitz Furniture chain, joined Jennifer in 2013 while it was still in the midst of consolidation under the new owner. His first assignment was as store manager at the retailer’s worst-performing location in Long Island, N.Y. After leading a turnaround there, Zou decided to move Garg to Jennifer’s flagship Farmingdale, N.Y., and into the new headquarter there before placing him in charge of everything in December 2016. Immediately, Garg said he went to work to resolve a series of problems that were hurting Jennifer’s prospects. He brought in Synchrony, for instance, to offer a consumer finance piece that was missing, and he continued closing the rest of what he called Jennifer’s “classic” stores — small 2,000- to 3,000-square-foot spaces that, that Garg said were unprofitable and putting the entire chain at risk. “They weren’t doing justice to Jennifer for the customer walking in,” he said, adding that Jennifer’s 15,000- to 35,000-square-foot “home stores” offered a much better representation of the repositioned retailer, which had expanded well beyond sofa sleepers and into other categories, including stationary and motion upholstery and case goods. Since Garg took charge, Jennifer has shuttered about 25 stores, he said, pulling completely out of some markets, such as California, where it operated six stores and was hampered by high logistics costs. At the same time, it opened six of the larger format home stores — in Manhattan and other New York and New Jersey markets. All have performed well, Garg said, with single stores, in some cases, making up for loss of sales from entire closed regions. In 2016, the company also relaunched its website, this time with e-commerce capabilities, and Garg said Jennifer has captured incremental business. Also, about a month ago, Jennifer partnered with Amazon to become a furniture seller on Amazon’s marketplace. While Amazon’s cut of 15% of sales is steep, Garg said the exposure has been good for Jennifer, which is delivering to Amazon customers only in the Tri-State area from Jennifer’s New Jersey distribution center. And about three months ago, the company launched a second e-commerce site of its own that’s also gaining traction — sofabed.com, a “specialty store of Jennifer Convertibles,” according to the tagline, offering nationwide delivery. “For 40 years we were sofa beds, sofa beds, sofa beds,” Garg said, adding that the new site helps Jennifer play up what it’s known for without distracting from the bigger-picture mission of the rebranded Jennifer Furniture. The company also has opened a new wholesale division — Jennifer Wholesale — selling Morris upholstery to mom-and-pop furniture retailers, and that’s off to a strong start, too, he added. Through the rest of this year, Jennifer plans to open five more New York and New Jersey locations, including in New York City’s financial district, the Bronx and Brooklyn boroughs and in Secaucus, N.J. Morris’ promised capital infusion will accelerate that growth trajectory next year, Garg said. Jennifer’s key supplier remains stationary and motion upholstery producer Morris, which accounts for about 60% of sales and is expected to grow to 75% of the total by the end of the year. Asked about the potential impact of a 10% tariff on Chinese imports should it be imposed later this year, Garg said, he’s not expecting Morris to raise its prices on Jennifer. Other Jennifer sources include Klaussner, Universal, Ashley, Craftmaster, Legacy Classic, Global, Riverside and Liberty Furniture. Garg said despite a rough start to the year for many retailers in the Northeast, Jennifer’s sales are about even with last year to date, and he’s looking for “a promising third and fourth quarter” to hit the company’s $48 million-or-better target.